As an indie filmmaker we are always looking for equipment that has a good level of price to quality ratio. We have gone out and bought cheap equipment that works at first, but the quality doesn’t last. For a few years now, anytime we’ve needed shoulder rig parts like rails, handles, or little mounts so we can add more accessories on to our rig, we have been using a company called SmallRig. They have found that sweet spot between quality and price. SmallRig did send us over half of the equipment we will be talking about in this video, but the other half, we purchased ourselves over the last few years. This cage is one unit and you don’t have to disassemble the cage to take the camera out of it. You simply just place the camera in and screw it in from the bottom. Compared to the other cages we have used for the a7s, this one has a lot of room around the buttons and nothing is hidden behind any parts of the cage, so you can easily get access to them. It has 3 cold shoe connections so you can mount loads of accessories, and an HDMI clamp which is adjustable to fit different sized HDMI cables depending on which size you have. You can also get a top handle for the cage. The one we have has loads of screw mounts so you can attach more accessories, but SmallRig have other top handles to choose from which also work with this cage. The cage also has a Rosette connection which is built into the side. You can get many Rosette accessories, but the one we like the most is the wooden handle  and it’s not just because it looks cool. When going handheld, the grip is really comfortable, and it gets your hands away from the lens which prevents micro jitters. By having a Rosette connection on the side instead of a standard screw, it allows you to put a lot more pressure and tension on the handle and it won’t slip because of the small grooves of the Rosette. 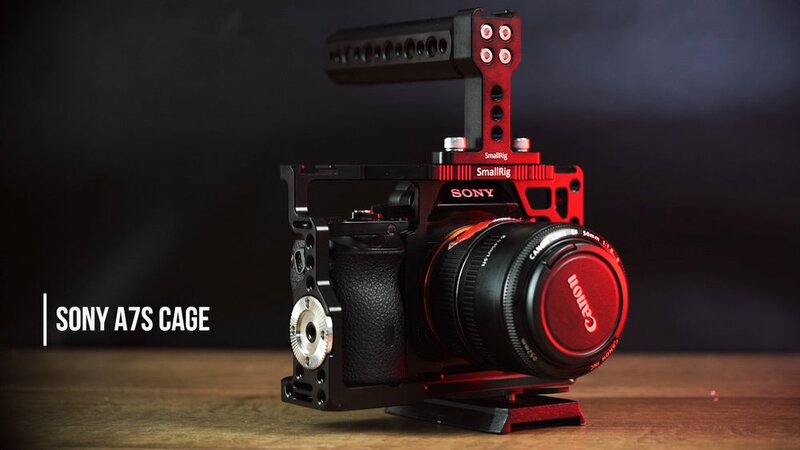 You can also get a bunch of other cages for other cameras from SmallRig, if you want to check them out for the camera you have. This is the setup we would use most days, but when we are shooting a film we would set up the camera like this. We will go into more detail about the other pieces of camera equipment we used to shoot our short film in a future video, so if you haven't already consider subscribing, but for now let's talk about how the SmallRig components have helped build this rig. This is the setup: we have a Manfrotto plate screwed into the Riser Clamp, which is screwed into the bottom of a Manfrotto release plate, then the camera slides on to this release plate. Then you can add 15mm rods to the riser and add a follow focus, a battery, or even a monitor by using this little clamp . By setting up the camera this way, you can take the camera off the tripod with the rail mount attached, or you can release it from the tripod plate and leave the rail system behind. This comes in handy if you just need to quickly pick up the camera and grab a shot without all of the other pieces of equipment attached. This setup works well on a tripod, but where the SmallRig components really come in handy is when you are building a shoulder rig. If you are trying to work out which components you need for your rig, go on the SmallRig website, look at what they have, and draw a couple of diagrams which has all of the components you are thinking to buy. By doing this, you can see which parts connect to other parts and work out what you need to build you rig. The next setup we have is our shoulder rig setup. We swapped out the 15mm rods for longer ones so we could attach a shoulder pad  and this cross front handle kit which has two rubber handles . We have the camera as far back as possible so the weight is more on the shoulder and not front heavy. We can still see what we are shooting by using the same rod clamp as before to mount our monitor further forward with a Articulating Arm,  so we can adjust the angle of the monitor with ease. We add all of the other pieces of camera equipment and we have this. The wooden handle is not really needed on the cage so instead of using the cross front handle kit, you could get this Rosette to rod clamp so you can attach the wooden handle to the 15mm rods. By only using the few parts we have, we’ve managed to build many different setups which work in different situations. You can get this Rosette extension arm so the rig handles are not straight in front but down by your side which is a lot more comfortable and it means you can tuck in your elbows creating steadier shots. The cross front handle kit can be setup as a fig rig by turning the handles upside down and mounting them next to the camera. 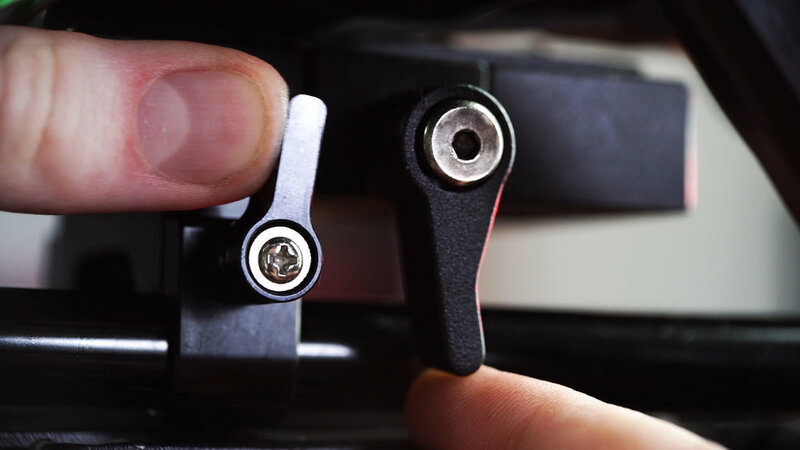 All of the components from SmallRig are built out of metal; the nobs tighten well, and they are built with a ratchet system. So if you can not turn the nob any further, because something is in the way, you just need to pull it out, turn, and tighten. Like I said at the start of the video, SmallRig have a great price to quality ratio and they have lots of products that solve problems you didn’t even know you had.